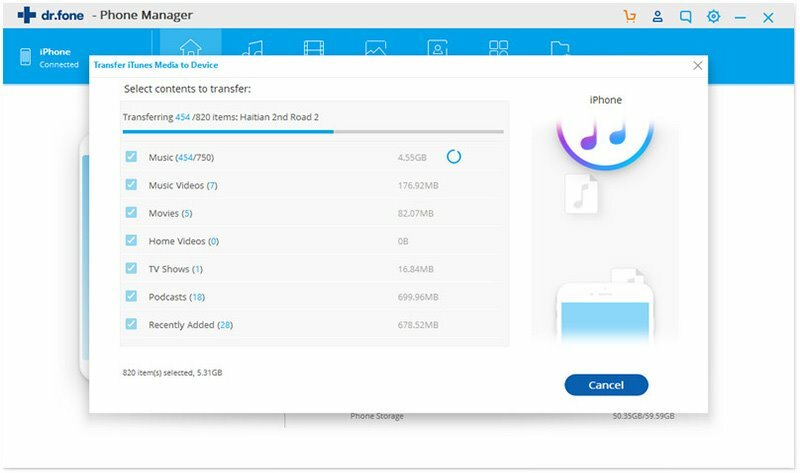 Importing file(s) to iPhone/iPad/iPod or exporting file(s) from iPhone/iPad/iPod can be tedious and complicated, sometimes even infeasible. 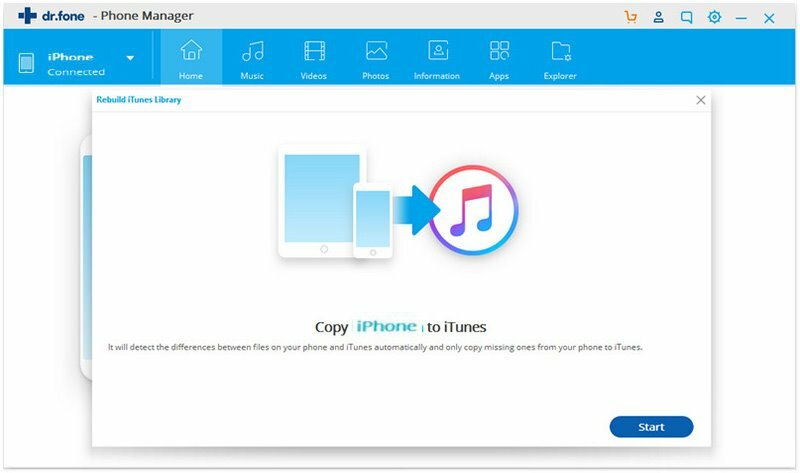 However, iSkysoft Toolbox – Transfer, a file transfer utility simplifies file migration between iOS devices, iTunes and computer to a couple of clicks. 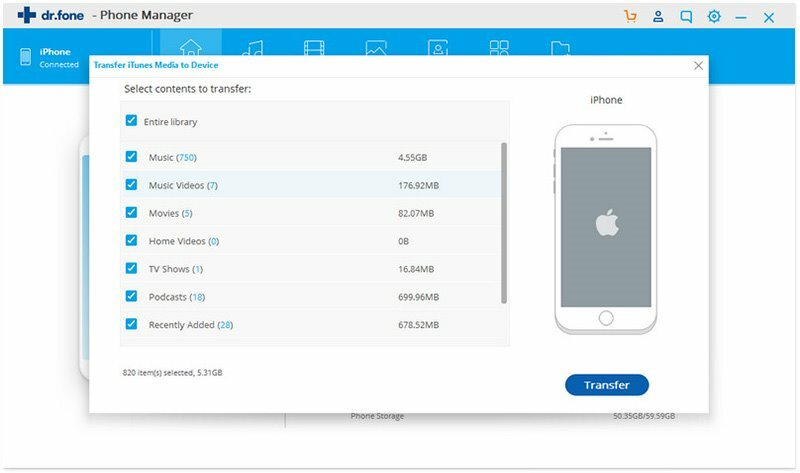 Let’s go through how to transfer files between iPhone/iPad/iPad, iTunes and computer via iSkysoft Toolbox - Transfer. 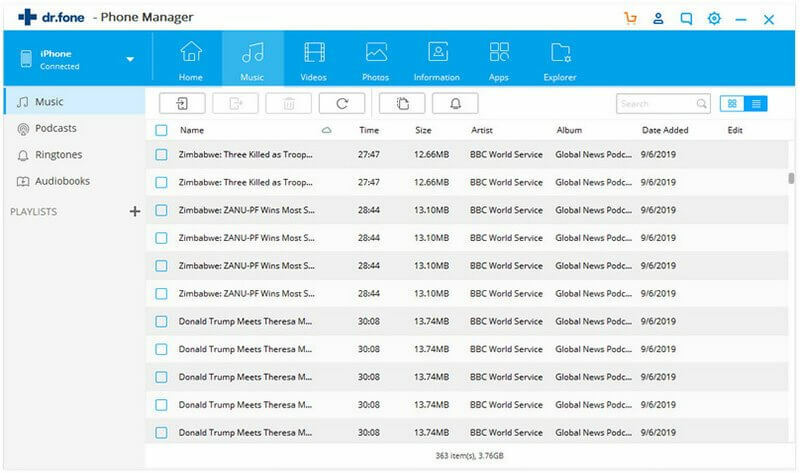 First of all, download and install iSkysoft Toolbox, then launch the program and hit Transfer on the main interface. Step 1. 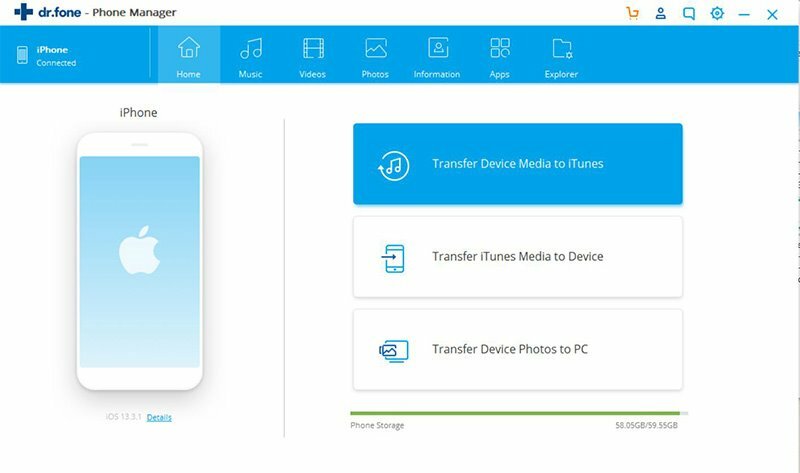 Choose “Transfer Device Media to iTunes” on the main screen as the image displays below. Step 2. 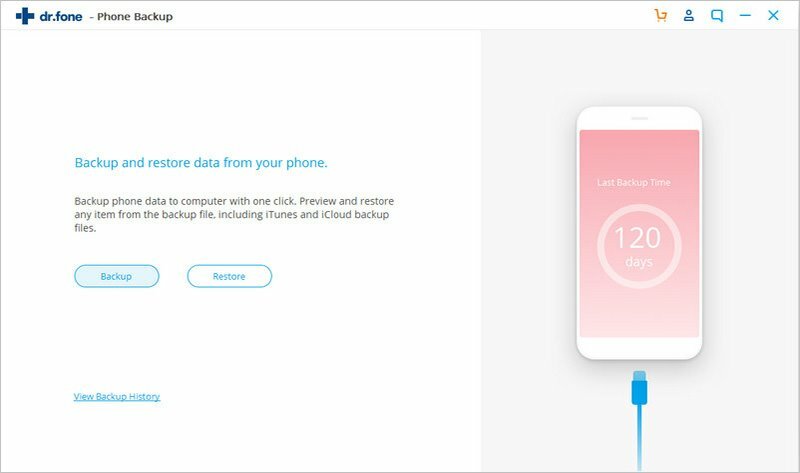 A popup will remind you that the program will detect the differences between files on your device and iTunes automatically, and only copy missing media files like music, videos, podcasts, audiobooks, playlists, artworks and so on to iTunes. Now click Start to continue. Step 3. 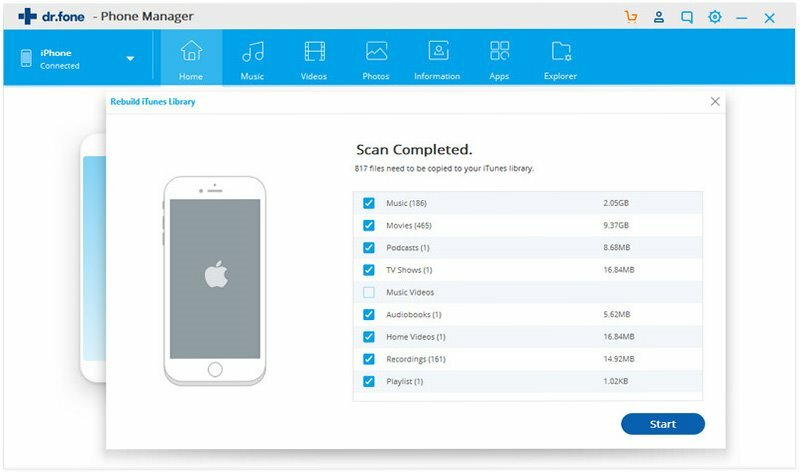 When scanning process finishes, hit Start button to sync your iPhone media files to iTunes. You could selectively transfer file types by unchecking the checkboxes beside the unwanted files. Step 4. When it is done, click on OK to close the popup panel. Step 1. 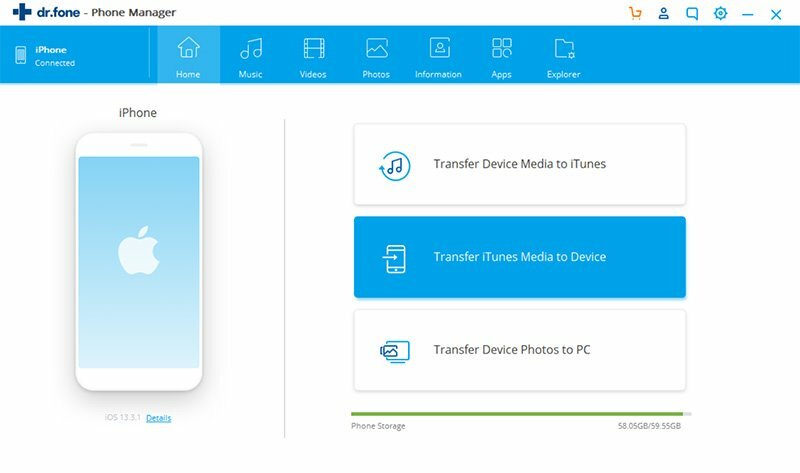 Choose “Transfer iTunes Media to Device” on the main screen as below. Step 2. 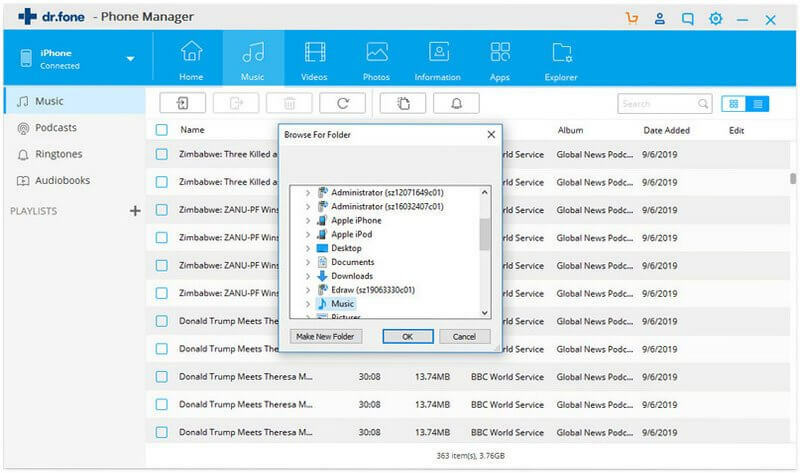 The program will auto-scan your iTunes library and display all the media files on a popup window. Choose the files types you would like to transfer, and then hit Transfer button on the bottom to start. Step 3. 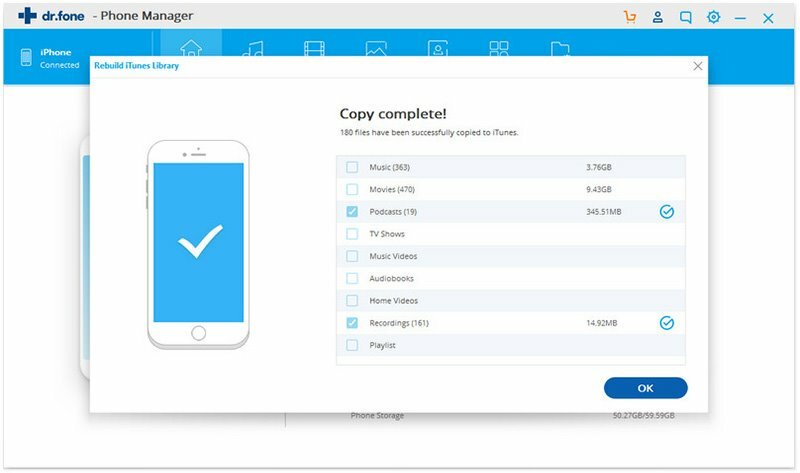 All selected media files will be added to your iOS device when the transferring process finishes. Step 4. The final step is to click on OK to close the window. 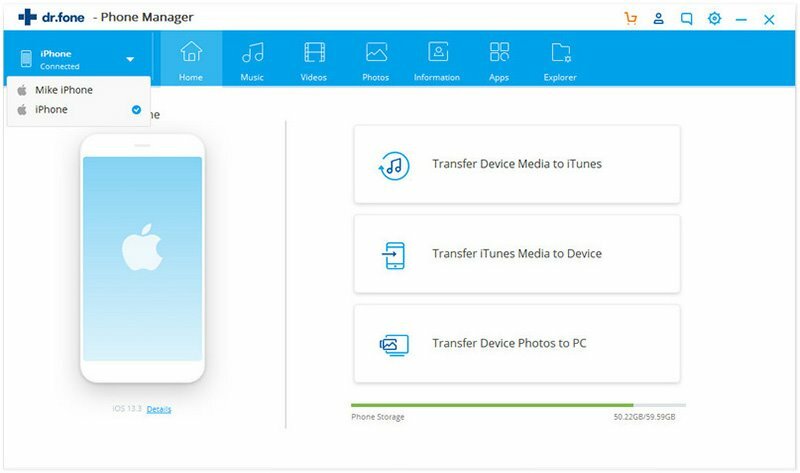 iSkysoft Toolbox – Transfer provides the easiest way to move all the photos (including live photos, app photos, recently deleted photos, screenshots, camera roll, etc.) from iDevice to PC within 3 clicks. Step 1. 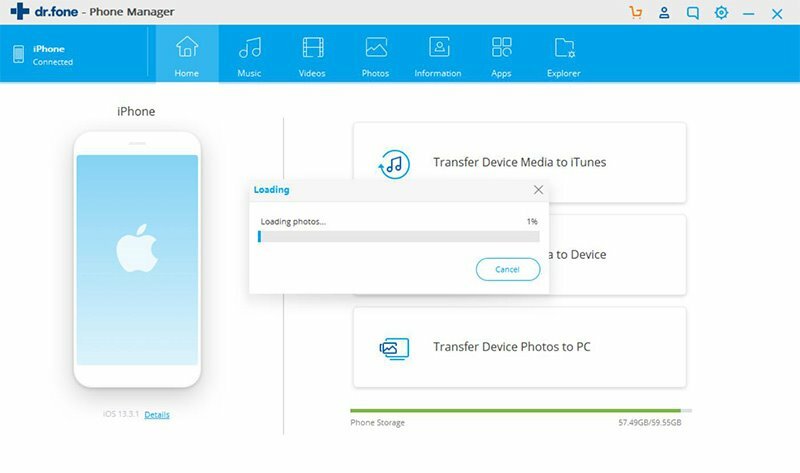 First choose “Transfer Device Photos to PC” on the main interface, and connect your device to PC. Step 2. 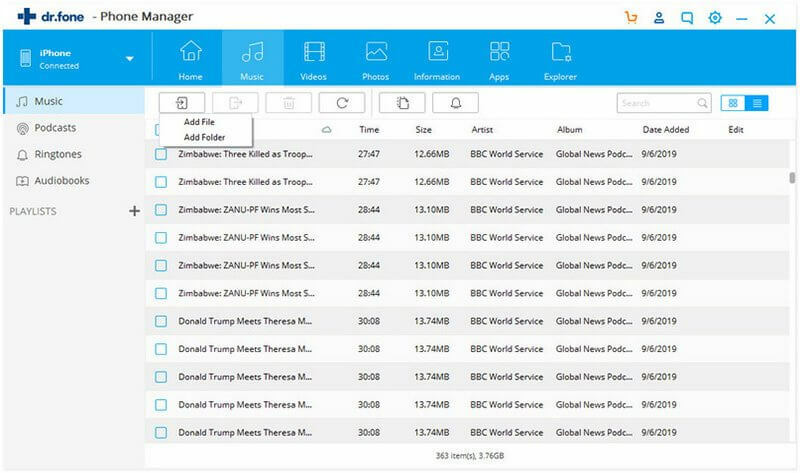 Browse your computer to select a target folder to save the photos, then click OK. Step 3. Wait for the photos transfer process to finish. Step 4. When it’s done, click Open Folder to enjoy the photos on computer right away, or click OK to close the window. 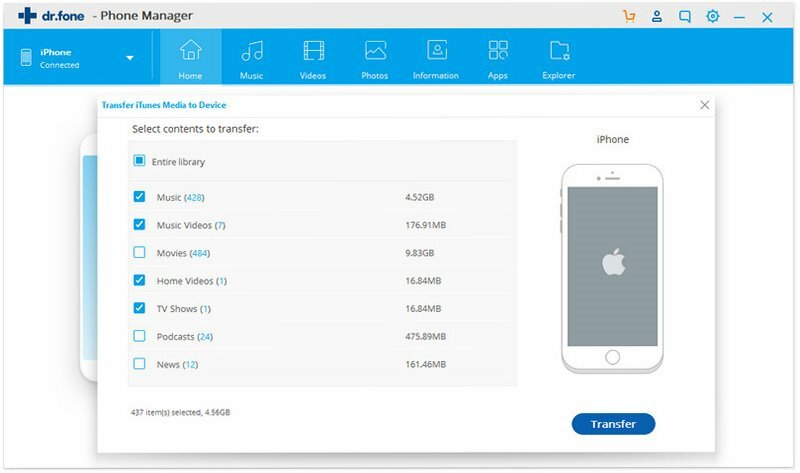 Except for media files, iSkysoft Toolbox – Transfer also supports to transfer many other kinds of files such as contacts, messages, apps, and so on. No matter what you would like to transfer, the steps are similar. So here we take music as an example. Step 1. Choose Music tab on the main interface. 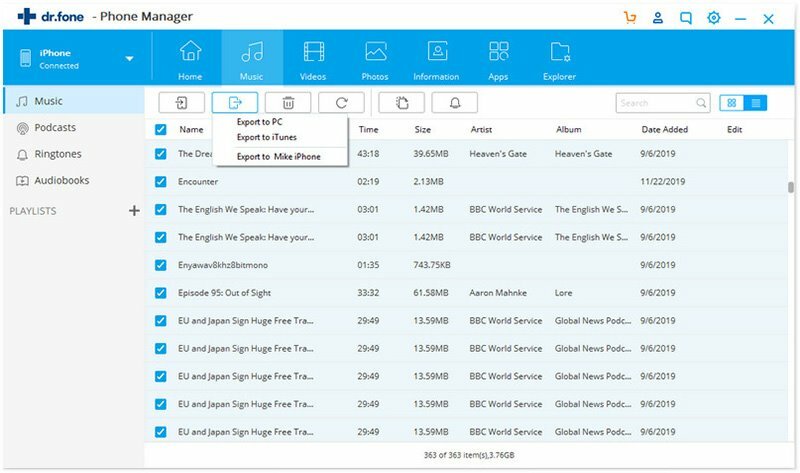 Here you could view all kinds of music files, including podcasts, ringtones, audiobooks, and so on. Step 2. 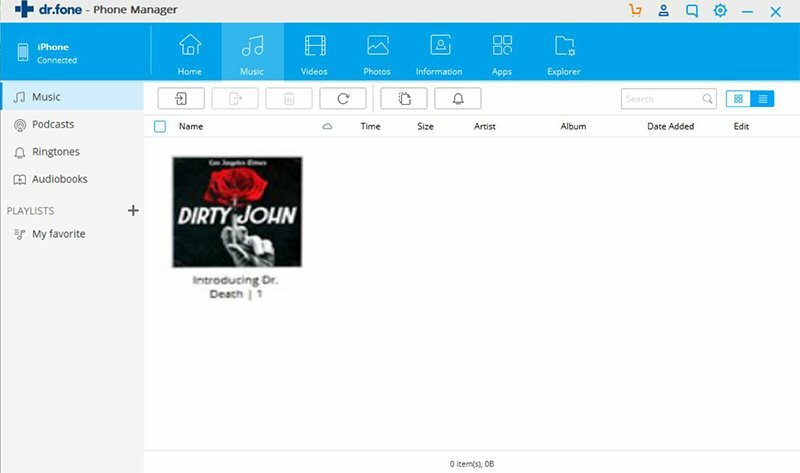 Hit Add button on the top left on the program as below, and then choose Add File or Add Folder to import file(s) to your device. Step 3. Select the file(s) you would like to add. If you have chosen Add Folder at the previous step, you need to select a folder that contains music file(s). Step 4. 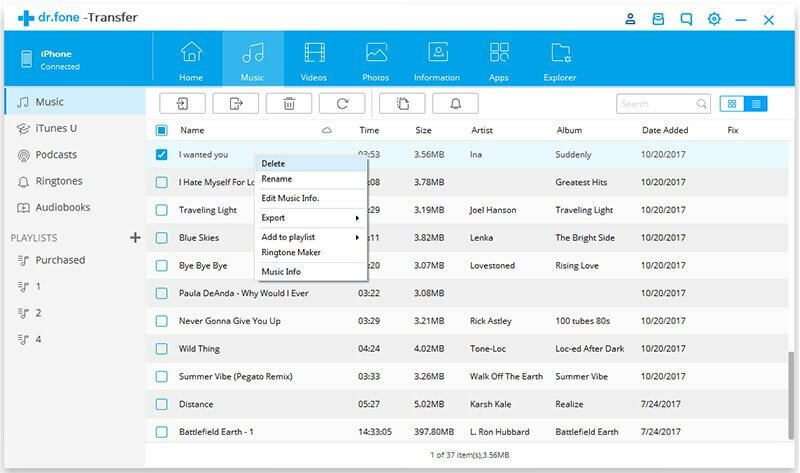 When the music files are added to your device, you could right click them to make further operation. 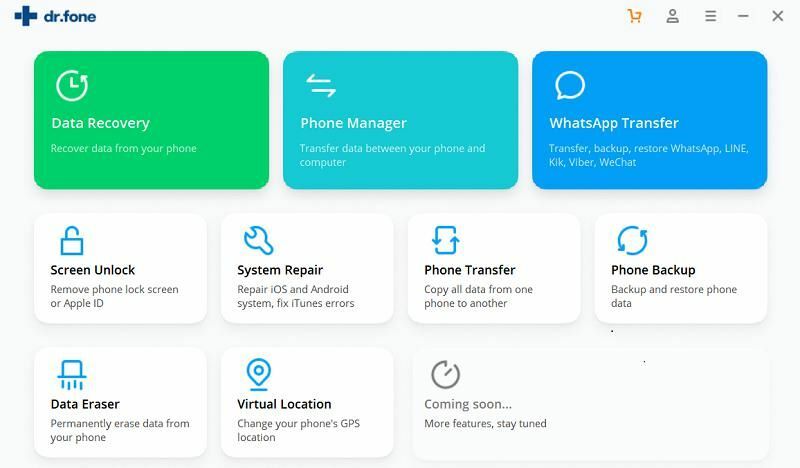 For example, you could rename it, delete it, add it to playlist or even use it to make your own ringtone via built-in ringtone maker. Step 1. 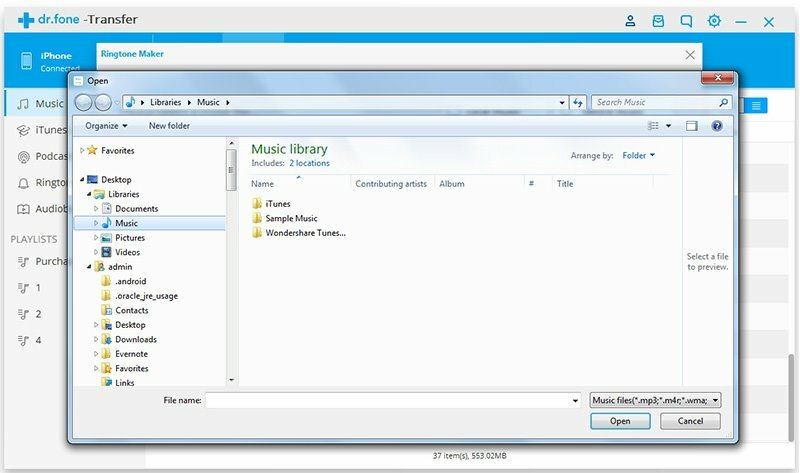 Choose Music tab on the main window as before. You could change the list view to cover view by switching the View button on the top right. Step 2. Check the box on the left of the files you want to select. To select all at once, Press Ctrl + A on your keyboard. Step 3. There are two methods to export files. The first is to click the Export button near the Add button. 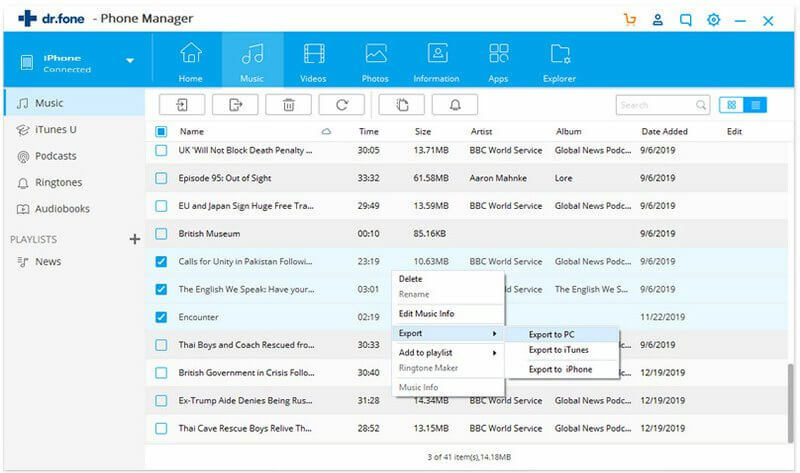 The second is to right click the selected files and then choose Export. Step 4. If you choose to export selected files to PC, you need to select a folder to save the exported files. 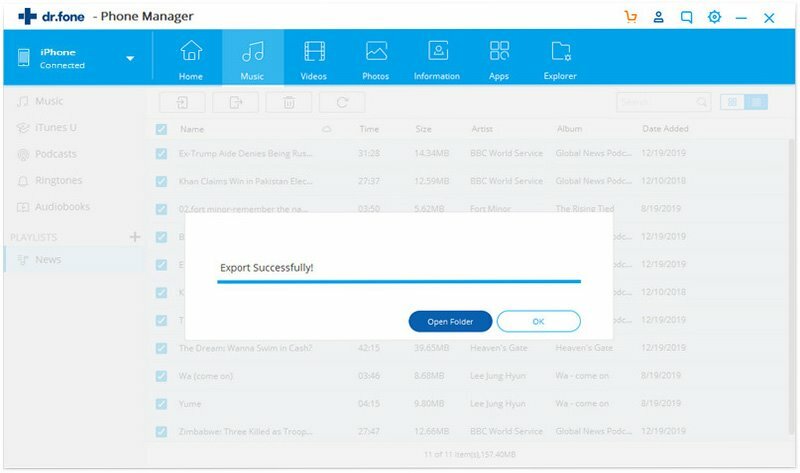 If you choose to export them to iTunes, the transfer will begin right away and shows the result. Click OK to finish it.